David Finn, professor and international director in Orlean Beeson School of Education, received Samford University’s John H. Buchanan Award for Excellence in Classroom Teaching in the opening convocation of the fall semester Aug. 29. The award goes annually to an outstanding faculty member chosen by a student and faculty committee from nominees submitted by the graduating senior class. The award is named for a former longtime trustee of the university. Finn, who has taught at Samford since 1998, specializes in children with autism spectrum disorders and more recently has worked with the needs of refugee families worldwide. 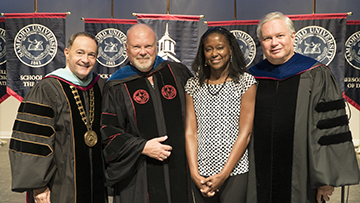 Eilani Grayson, program coordinator for computer-based testing in McWhorter School of Pharmacy, received the Bill Nunnelley Award. The award recognizes outstanding job performance by a nonfaculty employee whose work regularly and consistently exceeds expectations, and reflects a high level of service, trustworthiness and respect. The award is named for a longtime employee of Samford’s news and communication office. Grayson has worked in the pharmacy school since 2000 and assumed her current role in 2015 when the school adopted a new computer-based testing platform. She also serves as administrative assistant for the Department of Pharmaceutical, Social and Administrative Sciences. “The overall successful implementation of ExamSoft can be directly attributed to Eilani’s hard work and going above and beyond the call of duty,” said Bruce Waldrop, department chair.